How to get there: A good point of reference is the small community Holøydal. From the north, take Hwy. 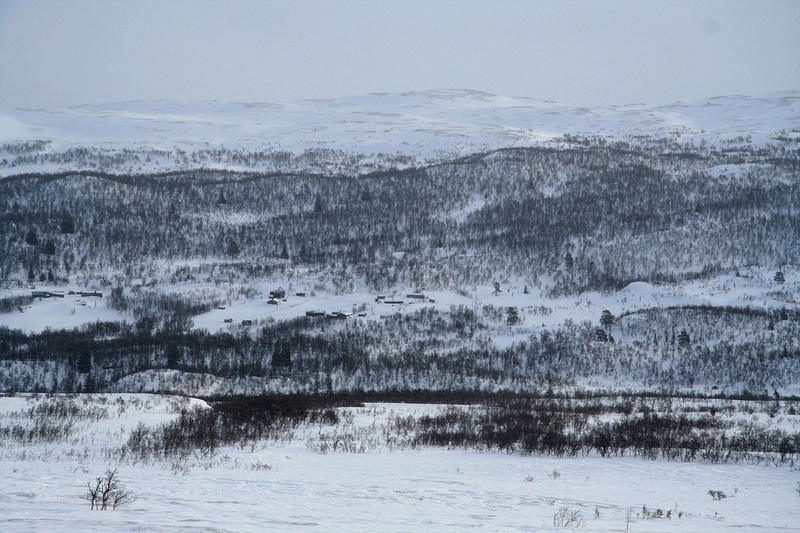 30 from Røros to Tolga and turn left onto Hwy. 26. From Tynset, go northeast on Hwy. 30 to Tolga and make a right onto Hwy. 26. From the south, take Hwy. 3 to Koppang, then Hwy. 30 to Åkrestrømmen where you turn right onto Hwy. 217. After following Hwy. 217 for 48 kilometer, make a left turn onto Hwy. 26. Holøydal is about 39 kilometer south from Tolga and 114 kilometer north from Koppang. Driving north on Hwy. 26, you arrive at a road fork where Hwy. 28 forks right (to Røros), while Hwy. 26 continues (left fork) towards Tolga. Measure from here. Continue 17.7 kilometer. As you come down the hill, look for a road that exits left with a sign saying Kvennhusbekken hyttegrend. This is shortly before you pass the church that is located on the right hand side about 150 more meter. Take this road. After 320 meter (kilometer 18), cross a bridge and keep right as the road curves. Drive through a farm area and take the right fork at kilometer 18.3 At kilometer 19, you drive uphill and soon you see a small road (possibly closed) forking right. Continue to kilometer 19.1, where you may park on the right hand side. This is the Øveli farm, ask permission to park here. This is the trailhead, location N62:12.150, E011:25.501, elevation 748 meter. 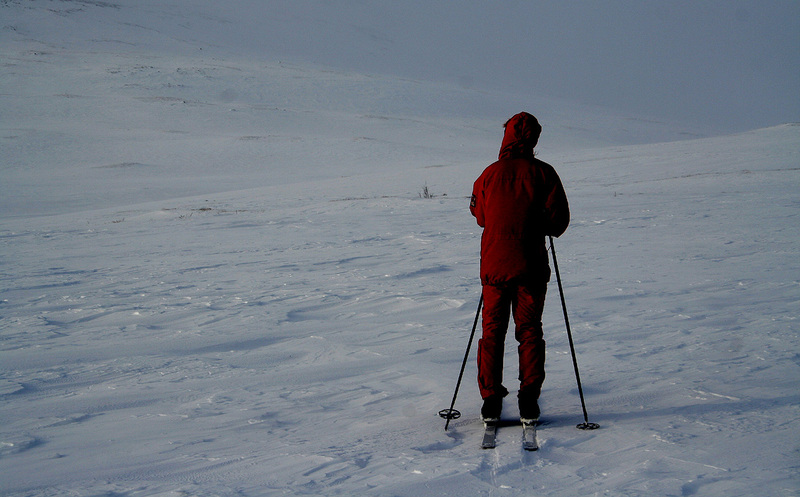 Route description: Walk or ski back down the road for about 100 meter and turn sharply left on the (summer) road towards the Orvdalssætran. This road runs south along the Orvdalen valley. Follow the road for approximately 2.5 kilometer. Leave the road (going right) and look for a reasonable way to cross the area in front of you. A few rather steep hills both up and down may be hard to avoid as the creeks have dug rather deep mini-valleys in this area. An alternative would be to ski further along the road and cross higher up, possibly near the lake, this is longer, but the terrain is likely less rugged. Eventually, you emerge on the large and very gentle slope that rises towards the west. 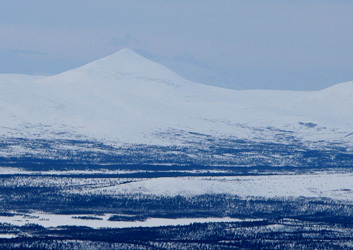 Gråhøgda (1370m) is to your right while Elgspiggen points to the sky on your left side. The route now runs more or less directly towards the Elgspiggen summit. The slope is quite moderate, then becomes quite a bit steeper near its upper end. Depending on the conditions, one may elect to leave the skis somewhere on this slope, most likely before the last 100 vertical meter. 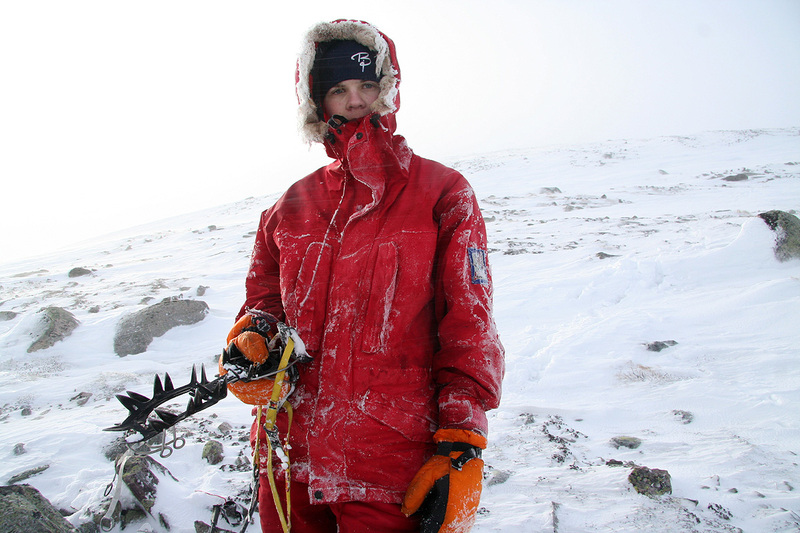 Comments: We started out at 0820 and skied quite easily along the road to Orvdalssætran. A bit before this place, we decided to cross the valley to the Elgspiggen side. This area has a couple of creeks with fairly deep valleys, however, the skiing that looked complicated turned out to be quite acceptable. 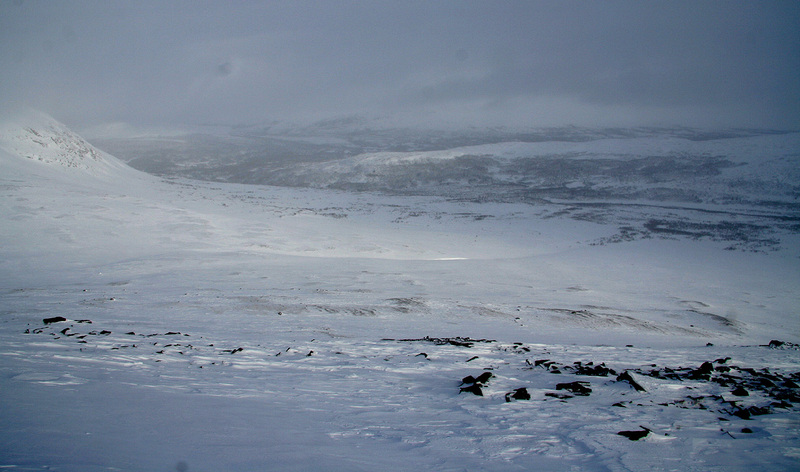 The wind was definitely to be noticed as we crossed the large, very gentle slope leading towards Elgspiggen. The mountain was all hidden in clouds as we skied uphill a bit higher than 1200 meter. Here, we ran into quite a few rocks, since the weather was pretty bad and the visibility very limited, we decided to leave the skis and hike straight uphill on foot. This still required about one hour as we arrived on the summit at 1140. 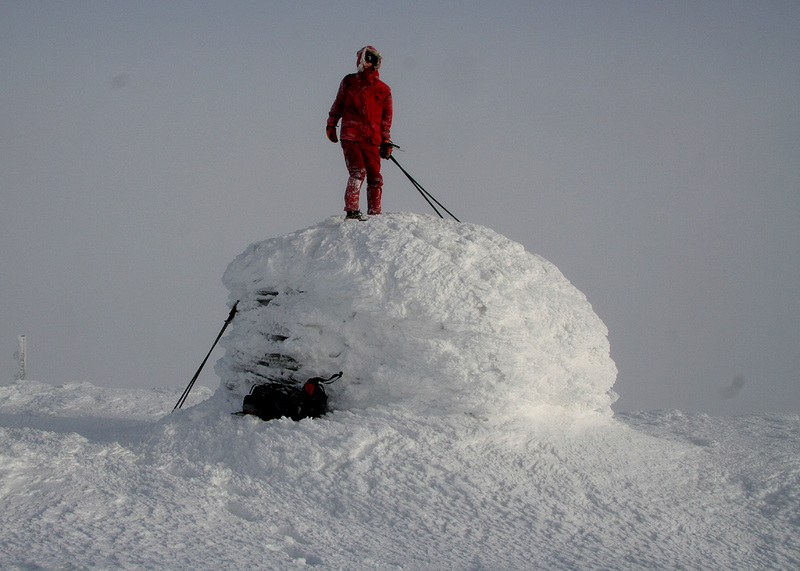 A very nice summit: Pål Jørgen cleared the last steep section, then popped directly out on the flat just in front of the cairn. We could see the sun through a thin layer of clouds, in fact, straight above us we had blue sky. It was quite windy, thus no place for lunch and we started our descent about 15 minutes after arrival. We rested further down where the wind subsided, before skiing back to our car, arriving there at 1350. Driving back to our "base camp" at Johnsgård, we would have a long afternoon before our last goal, Sålekinna, that we shall attempt the next day before our long drive back to Bergen. Global warming and climate change? As we returned from this climb, the temperature had changed to plus 4 Centigrade and we had light rain. Here, as far inland as one can get in Scandinavia at about 700 meter of elevation, rain in mid February. This is the time of year where temperatures between minus 15 and minus 30 should be considered normal.